$69 for three months of anytime/anywhere access.Student, teacher, veteran, civil servant? Click here for special discounts! Want to use your skills and knowledge to help people as an Emergency Medical Technician-Basic? You’ll have to pass an NREMT certification exam first. Fortunately, there’s our comprehensive EMT review guide to give you a leg up. Over 1,000 practice exam questions with full rationales: Huge bank of practice questions to evaluate and sharpen your knowledge, each in the exam multiple-choice format and including a detailed explanation of the correct answer. Three different testing modes allow you to simulate the EMT exam, go through each question and rationale one-by-one, or take a quick quiz for when you want to squeeze in some extra review. Try a free practice quiz today! With our review package, you’re in control of going over information at your own pace. Whether you learn best through reading text, looking at pictures, going over charts, or testing yourself through review questions, we have something to help you excel at this important milestone in your EMT career. 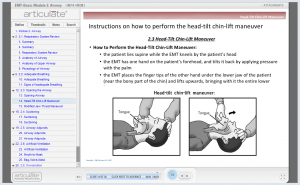 Many sites that claim to help you prep for the NREMT exam only have review questions, with minimal additional support or explanation; our review system carefully guides you through all the material you need to know in slides, pictures, and charts, as well as banks of practice questions and vocab words. On the other hand, review guide manuals you can purchase in print don’t contain the same opportunities for visual and interactive learning that our online package does. This truly is the most comprehensive way to review for this vital step in your career. Looking for a different EMT exam? Check out our coming soon page.